Happy New Year! To kick off the first newsletter of 2016 we spotlight a popular topic this season in a new blog entry: Will a lower priced punch be ok to punch tags? Reaching back into the video vault we’re giving you an up close look at looseleaf report/booklet covers. And how’s this for a segue? Speaking of report covers, tax season is here, so we’ve made deductions from the normal cover prices: save 5 % on all covers for this month. 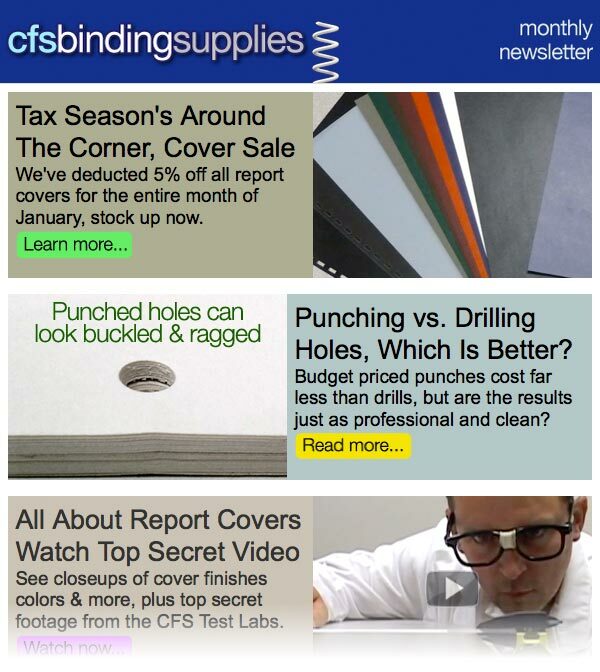 You can view our full newsletter by clicking the image below. If you’d like to get these helpful tips in your inbox once a month, just add your email address in the form located toward the upper right of this page and click SUBSCRIBE ME. 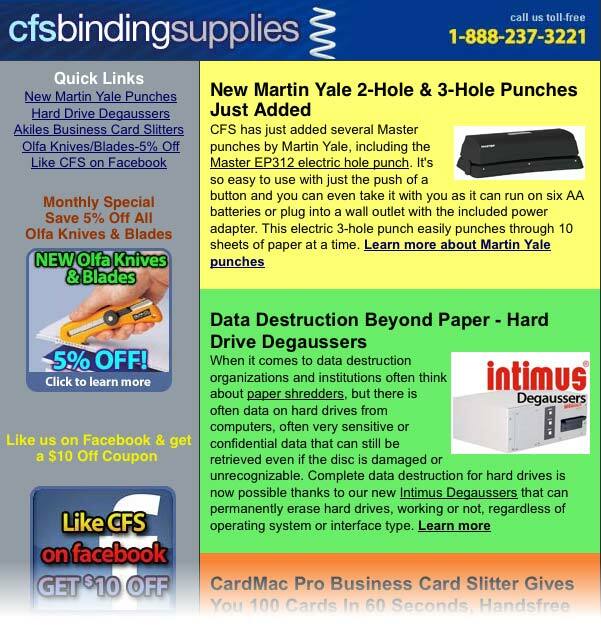 May’s newsletter is all about newly added products including Master heavy duty hole punches by Martin Yale – there are manual models that punch up to 40 sheets at a time and electric, push button models. Deguassers are a brand new product segment that permanently erase your data on old or broken hard drives. We’ve also added several business card slitters including the fully automatic Akiles CardMac Pro that produces 100 cards with full bleeds in just 60 seconds – handsfree! Three hole punching is now a breeze thanks to the the Master EP312 electric hole punch by Martin Yale – all it takes is just the push of a button.You can even take it with you as it can run on six AA batteries or plug into a wall outlet with the included power adapter. This electric 3-hole punch by Martin Yale easily punches through 10 sheets of paper at a time. Thanks to an adjustable sheet bottom guide and the three fixed hole dies, you are sure to get perfectly positioned holes every time that fit standard 3-ring binders. A large capacity waste storage bin is built into this unit and can be emptied using the door on the bottom of the base – keeping your desk or counter free of those annoying confetti messes. CFS has several hole punch machine choices and there will be several manual version added later this month. Got any questions on punches? Ask away in the comments below. 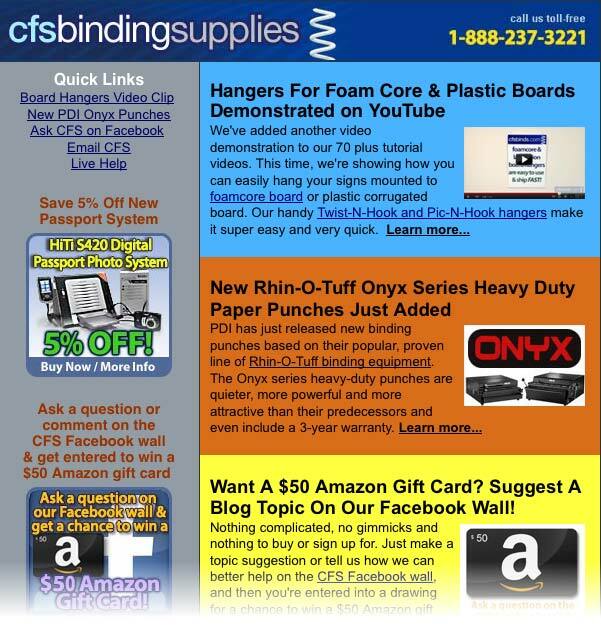 In our latest issue of the CFS Binding Supplies newsletter, we show a video tip on easy options for hanging signs or point of purchase posters mounted to foamcore boards or plastic corrugated boards. We also feature PDI new additions to the Rhin-O-Tuff heavy duty punch line: the Onyx series. We also featured another 2 Minute Tuesday post answering questions on Foam Core Boards. Joe’s Question Corner: Can I Punch Holes With A Handheld Drill? Q: “We occasionally need to drill holes for some binding jobs we do, but the amount we do does not justify the cost of a Paper Drill. Can I use your paper drill bits in a regular handheld drill to do it? A: We actually get this question a lot. 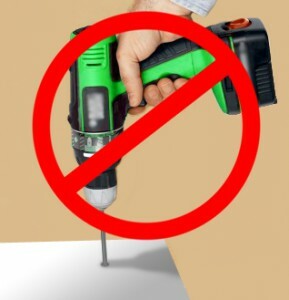 We do not recommend it since the paper drilling bits are thin, hollow metal tubes that – if not drilled 100% straight down could damage the bit – or worse: injure the operator! Additionally, the hollow bits used in a standard drill have no where for the waste paper chips to exit the inner part of the bit and their collars that fit into the drill chuck are tapered or at least 1/2″ in diameter. A paper drilling machine will allow the bit to travel straight down and has a head designed to allow the waste chips (or chads) to exit the bit into a waste chute. A standard drill press (often found in a workshop) will allow the correct bit travel, but has no waste exit method and is limited to using only the Lawson paper drill bits so long as it has a 1/2″ chuck/head. A lower cost and frankly much safer option would be a Heavy Duty Paper Punch (like the FP-1 Punch). These punches work very similar to a paper drill press without the need for electricity and a large pocket full of cash. They are easily stowed away when not being used and capable of punching up to 300 sheets of 20# paper at a time. Now you can save your cash and possibly a trip to the ER. Got any special punching needs? Tell us about them in the comments below.